My friend called before sunrise. “You gotta do me a favor,” he said. Outside, the sky was lightening grey. The snow had turned to freezing rain just after midnight, hiding the steps and streets of Brooklyn beneath inches of white crust. “This book is intended for people who have become paralyzed by a fear of sin,” I read. It was seven a.m., and the worst crowds of the morning commute had not yet arrived. With my friend’s car key bulging in my coat pocket, I sat on the end seat of an empty row of an uptown train, thumbing through a small, green paperback. 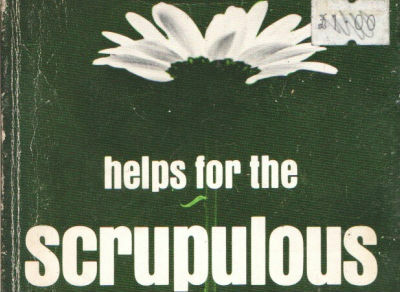 Helps for the Scrupulous, by Russel M. Abata — c.ss.r, s.t.d. It was a Catholic book, its author a Redemptionist priest. I stopped reading, holding my place with a cold thumb. 34th street had arrived outside the window. Yawning, I watched the growing throngs exchange, and felt my mind lope, unbalanced, into some version of its daytime consciousness. My eye rested on a girl in a green scarf, fidgeting across the platform. I winced, recalling the life of a tenth-grade cuckold. Beside her, a man in a brown-banded hat held me in a serious gaze — aware, somehow, of my looming deadlines. A sour pile of derelicts boarded the train, cackling about my student loans. I shifted uncomfortably, feeling lousy and found-out. The doors closed with a chirping “ding.” As we pulled into the unlit tunnel, I returned to the book. “Somewhere inside of the [scrupulous man] are the screams and warnings of teachers and parents about fire and burning, snakes and rats, thirst and hunger,” Abata continued. For the scrupulous, the fears of childhood had congealed into unending anxiety. Those afflicted constantly check and re-check their actions for spiritual error until, inevitably, it is found. “After a while,” the priest continued, the sufferer of scruples “has accused himself of so many serious sins that he has backed himself into a corner. He can hardly make a move until he has been assured many times over that it is alright.” This constant need for validation makes the scrupulous person into a difficulty for their friends, a trial for their family and terror for their confessors. The scrupulous, he observes, are prone to crisis. I arrived at the skyscraper on Madison Avenue at just past eight o’clock. My friend met me in the lobby. “My wife is gone, right now. She’s out at a teacher’s convention in Orlando with the kids and I would’ve gone too, except the office has me rewiring pretty much all the electronics on the fifth floor. I’ve been staying up late, banging it out, getting by on that Indian speed I told you about. Most nights I don’t go home. He handed me his phone as we trudged along the avenue. She was attractive. “Her husband’s been fired from his job four times in last five years,” he said. I handed back the phone. “Anyway, we’re making out and her friends start getting mad — they want her to leave. And one of them is real difficult — she keeps saying, like, ‘oh you have kids! you’re married! What are you doing?’ So we have to get away from her. “By then — it must have been three or four in the morning — everybody was drunk. I suggested that we go outside and get some air. We did — and we tried to get back to her hotel, but she was so drunk we couldn’t find it. We must have stopped in at three, maybe four. I don’t really remember. “It was around then that I noticed my car key was missing. I’d left my jacket on a stool at the bar, back when we were dancing, but I always keep my key in a special pocket under the lining — behind a zipper and everything. Somebody just opened it right up. By this time, we had arrived at the car. It had already accrued a ticket, costing my friend one-hundred and twenty dollars. He groused about this as we drove to a parking garage. “I need to feel you again,” said the phone. His work was highly technical, his office a maze of server racks and switcher boxes and thick, rainbow cords of wire. I was given the tour. Our talks were often concerned with the professional differences between us. For my friend, the idea of writing for a living was misty and inexact. It relied too much on language, and language, he thought, could never be reliable. For my part, I was mystified by the practical realities of engineering — and in awe of my friend’s capacity to master and construct complex networks of devices. “It just has to work,” he said, but I never quite believed him. Failure, I still believe, is analogue. “How about you?” my friend inquired, after a long pause. “Jean,” Abata wrote, “is over-worried about harming and even killing people.” She “continually washes her hands while cooking,” compulsively “rechecks the gas” before leaving the house and cleans her dishes with nervous exactitude. “Jean,” the priest explained, “is a lady.” Her concern for propriety has become a painful repression. “Timothy” is eaten alive by the guilt of acquiring money unlawfully. Now retired, he sanctions himself for not working harder — and for committing a minor variety of insurance fraud. “Ann” is haunted by “the first time [she] touched herself impurely,” when she was fifteen. Her fear kept her from confessing the problem properly, and the secret has become painful and ingrown. “Michael” has begun to doubt God’s capacity to forgive. “Obviously, that cannot be healthy,” he concludes. His advice in a crisis? Assure yourself you are “NOT GUILTY,” and “DO NOT ARGUE” with the resultant compulsion to examine and reexamine the situation. Accept yourself without examination. That, he says, will win some degree of peace. Scruples were not always holy, Faber acknowledged. More often than not they could be traced to the trickery of the Devil, or some defect of the body or soul. Confirmed cases of divine scruples were, the priest admitted, exceedingly rare. Still, scruples were not to be taken lightly. Their soil could bear the seeds of sainthood. As the nineteenth century advanced into the twentieth, Catholicism’s theological authorities began backing away from this noble model of scrupulosity. God, as dictated the fashion of the day, was more of a kind redeemer than a punishing judge, and the willful withholding of Love began to be viewed as unnecessarily cruel. What’s more, psychology had begun sniffing around the obsessive behaviors of the scrupulous — claiming more and more of their suffering for the unconscious mind. Bit by bit, potential sainthood became a nervous disorder. The Second Vatican Council (which lasted from 1962 to 1965) served as a final tipping point. Afterwards, scruples became, at their most respectable, a deformation of pride. Their treatment was surrendered, bloodlessly, to medical science. In 1972, four years before the publication of Helps For the Scrupulous, an edition of writings by the neurosurgeon John F. Fulton was issued, under the title The Frontal Lobes and Human Behavior. One case it detailed centered on a woman wracked with doubts about her grievous sins and the anger they had inspired in the Holy Ghost. Fulton supplied her with only a local anesthetic, and asked that she made careful report of her condition as he cut into her brain. She remained conscious, and talkative. Helps For The Scrupulous is a point on a continuum of decline. In it, Abata does not debate the findings of the psychologists and agrees with them that the origin of scruples is, for the most part, defects in the unconscious emanating from childhood. Still, in a small way, Helps seeks to imbue the struggles of its scrupulous readership with spiritual weight and small measure of dignity. By the beginning of the twenty-first century, even this was out of fashion. I sat with my friend, in the empty room, and explained all of this as best I could, illustrating my points by referring to Abata’s paperback, which I had, by that time, extensively annotated and underlined. He paused when I was finished. “That is — without a doubt — the dumbest problem I have ever heard,” he said. We walked together to the lobby, and he thanked me for delivering his key. After leaving the office, I went for a long and aimless walk. Eventually, I arrived before the side entrance of St. Patrick’s Cathedral. Work on the old hall’s restoration, still ongoing as of this writing, had surrounded its facade with a maze of plywood and dense lattices of black aluminum. I stepped between them, climbed the steps, and went inside. It was a quiet. The cathedral’s floors were polished to a mirror-shine and its pews were lacquered crimson, shady and unoccupied. Overhead, stone shot from stone — a riot of dark solidity. Stained glass gleamed above the organ. My fellow congregants were, for the most part, workman. Their rubber soles squeaked on the stone as they hauled materials around the Sanctuary, dodging their bright orange machines and ducking in and out of their curtains of plastic. The few unpaid visitors to the place moved like ghosts from shrine to shrine, tracing the walls that ran out from the Bronze Door. I sat for while at the end of an empty pew, facing a facsimile of the Black Madonna of Częstochowa. St. Luke supposedly painted its original, still in Poland, on a hunk of table borrowed from the house of Christ and Mary. I tried to write, and failed. I dove into my phone instead, sending pictures of the shrine to a girl in Boston. She did not “need to feel me again.” In fact, she did not seem to “feel me” at all. Despondent, I stood up, and tried to wring some meaning from the icon. Around the Madonna, portraits of its patrons, champions and stewards had been arranged. They were fat and bearded and bald to a man. Their clear eyes, earnest and comical, stared out of a timeline of successive costumes. I longed to be counted among those holy dorks, to see my name etched into an identifying plaque of gold. I wished to find, within the lonely accident of living, some shards of a superior world. I’d trade in pain and terror for that, I thought. By then, it was early afternoon, and I was hungry. I left the cathedral and returned to my neighborhood by subway, where I stopped for corn beef sandwich on rye with extra mustard.